What Is the Most Common Type of Lung Cancer in Non-Smokers? What type of lung cancer is most common in non-smokers? Let's take a look at the answer to this question, and why the types of lung cancer and most common symptoms can vary based on smoking status. But first, if you are asking this question, it's important to give you a high-five. Many people do not realize that lung cancer can and does occur in former smokers and never smokers, and those who realize it does, are in a better position to recognize the symptoms of lung cancer should they occur. In fact, the majority of people diagnosed with lung cancer today are not active smokers, and unlike the recent decrease in lung cancer in general, lung cancer is significantly increasing in one group of people: young women who have never smoked. Lung cancer not only occurs in people who have never smoked but lung cancer in never smokers is the sixth leading cause of cancer deaths in the United States. When discussing the answer to the question about types of lung cancers in no-smokers, it's helpful to distinguish between "non-smokers" and "never smokers" when evaluating statistics. The category of non-smokers includes both never smokers and people who smoked at one time but have now quit (former smokers). 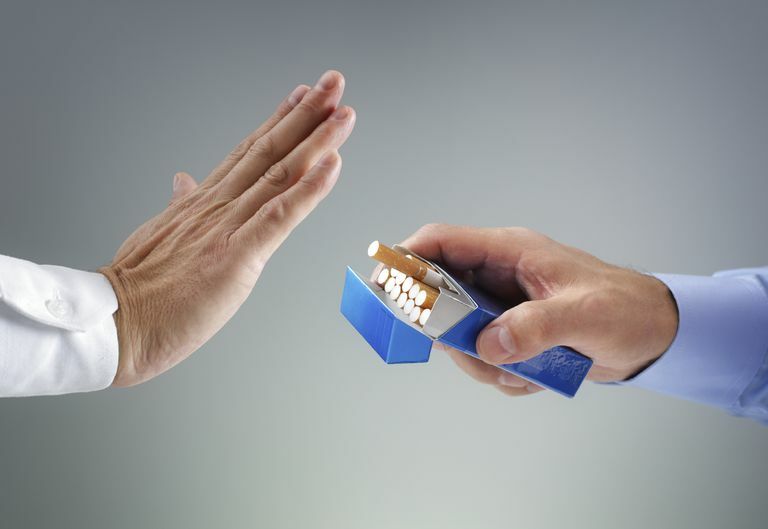 The term never smokers refers to people who have smoked 100 cigarettes or less during their lifetime. At the current time, roughly 15 percent of people who develop lung cancer are never smokers, and over 60 percent are former smokers. Only around 20 percent (depending on the study and geographic area) are active smokers. Added together, the majority of people are non-smokers at the time of a lung cancer diagnosis. Restated in a different way, people who are active smokers at the time of their lung cancer diagnosis are in the minority. In order to describe the types of lung cancer which are more common in non-smokers, let's look at the different types of lung cancer. There are two major types of lung cancer: non-small cell lung cancer and small cell lung cancer. These types are named according to the appearance of the cancer cells under the microscope, with small cell cancers being composed of, not surprisingly, small, abnormal appearing lung cells. Non-small cell lung cancer accounts for 85 to 90 percent of lung cancers and is the most common major type of lung cancer found in non-smokers. It is also, due to numbers, the most common major type of lung cancer found in people who smoke. There are different subtypes of non-small cell lung cancer, and these vary with smoking status as well (see below). Small cell lung cancer accounts for 10 to 15 percent of lung cancer and is much more strongly associated with smoking. It's thought that only around one percent of people who develop this type of lung cancer have never smoked. Carcinoid lung tumors are a much less common type of lung cancer (not all of these tumors are cancerous) that account for less than 5 percent of lung cancers. These tumors fall under the heading of neuroendocrine lung tumors that includes small cell lung cancer. Carcinoid lung tumors have not been clearly linked with smoking as have other types of lung cancer. They may occur at any age, and are the most common type of lung tumor in children. Most of these tumors grow near the large airways of the lungs, a location more commonly associated with the types of lung cancer strongly associated with smoking. Lung adenocarcinoma is the most common type of non-small cell lung cancer and is the most common type of lung cancer found overall in both non-smokers and smokers. It is also by far the most common type of lung cancer in women and young adults with lung cancer. Lung adenocarcinoma accounts for 30 percent of lung cancers in male smokers, and 40 percent of female smokers. In contrast, this type of tumor accounts for 60 percent of lung cancer in non-smoking men and 80 percent of lung cancer in non-smoking women. The other forms of non-small cell lung cancer include squamous cell carcinoma of the lungs which accounts for 25 to 30 percent of non-small cell lung cancers and large cell lung cancer which is present in 10 to 15 percent of non-small cell lung cancers. These cancers are both much more common in people who have smoked. Not all cancers are strictly defined by one of these subtypes, and it's possible for a lung tumor to have regions of lung adenocarcinoma as well as squamous cell carcinoma ("adenosquamous"), as well as other combinations of tumor characteristics. Why Would Smokers and Non-Smokers Develop Different Types of Lung Cancer? One possible difference in the types of lung cancer seen in smokers and non-smokers may be related to the particular areas of the lung most affected by the lung cancer carcinogens in question, whether this is tobacco smoke, radon gas, occupational chemicals, or other exposures. It may also be related to the type of damage (DNA mutations) caused by the particular carcinogens. At this time this question remains mostly unanswered. It's interesting to point out that with the addition of filters to cigarettes, the most common types and locations of lung cancers changed. Years ago, cancers such as squamous cell non-small cell lung cancer and small cell lung cancer were more common. These cancers tend to begin in the larger airways entering the lungs (the bronchi). After filters were adopted, lung adenocarcinoma became much more common. These cancers tend to arise in and near the smaller airways in the periphery of the lungs. The thought is that the addition of filters to cigarettes resulted in smaller particles (carcinogens) being inhaled and then deposited deeper in the airways, whereas without filters, larger particles would be trapped in the larger airways. Lung cancer in non-smokers is a different disease in many ways. Some of these differences are related to the different types of lung cancer. For example, small cell lung cancers, a type much more common in people who have smoked, are treated much differently than non-small cell lung cancers. Yet even among people with the same type of tumor, for example, lung adenocarcinoma, there are differences in the behavior of a cancer among people who have smoked and those who have not smoked. Non-smokers are much more likely to have treatable genetic mutations, such as EGFR mutations, ALK rearrangement, or ROS1 rearrangements. In contrast, people who have smoked may better respond to immunotherapy drugs. Immunotherapy medications available to treat lung cancer seem to work better when there are more mutations in the cancer cells (a higher mutation burden), and the cancer cells of people who have smoked tend to have many more mutations. Lung cancer can be very different depending on whether a person is an active smoker, former smoker, or never smokers, and one of these differences lies in the particular types of lung cancer which are most common. Lung adenocarcinoma, a type of non-small cell lung cancer is more common in never smokers, whereas people who have smoked are more likely to develop small cell lung cancer or squamous cell lung cancer, another type of non-small cell lung cancer. Alberg, A., Brock, M., and J. Ford. Epidemiology of Lung Cancer. Diagnosis and Management of Lung Cancer, 3rd ed: American College of Chest Physicians Evidence-Based Clinical Practice Guidelines. Chest. 2013. 143(5 Suppl):e1S-e29S. American Cancer Society. Lung Cancer Risks for Nonsmokers. 11/16/17.